More than 100 volunteers were welcomed in to the residences of East Palo Alto homeowners earlier this month during Habitat for Humanity Greater San Francisco’s latest Building Blocks event. Building Blocks is all about home repairs. It is the perfect way of providing a critical mass of volunteers to undertake larger-scale repair projects that need sustained effort. It is part of Habitat’s Neighborhood Revitalization program which aims to keep residents in their homes and part of the communities they love. One house in this round of repairs was occupied by an elderly widow who had lived in her home since 1962. Volunteers, led by an experienced Habitat building supervisor, ripped out and replaced dilapidated garden fencing and installed new flooring throughout the home which suffered from extensive termite damage. This is typical of the type of project Habitat undertakes. It aims to improve the security of the homeowner’s home and property, safety of the people living in the home, mobility throughout the home, weather-proofing (as well as weather resistance and energy efficiency), and functionality. Other critical projects included in this three-day event such as reroofing, exterior painting and, in one case, demolishing an unsafe shed, aim to support homeowners’ long-term ability to age in place and maintain the home as a legacy for future generations. Habitat Greater San Francisco’s repair programs are undertaken in its two focus areas of East Palo Alto (in San Mateo County) and in the Bayview neighborhood of San Francisco. A reporter and photographer from the San Francisco Chronicle met with volunteers and homeowners at the event. 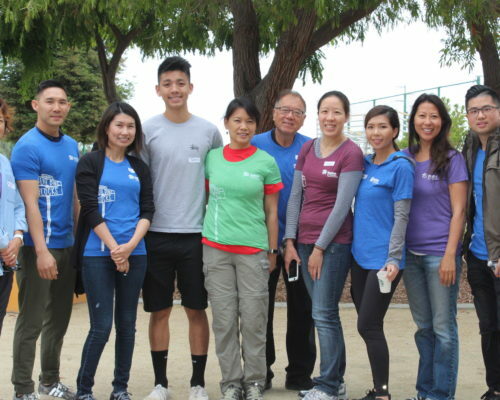 They saw individual volunteers working alongside groups from community associations and local corporations – with the local chapter of the Asian Real Estate Association of America providing large groups of helpers over two days. You can read the full story and view the carousel of photos here.